The podcasting phenomenon is soaring with 17% of the US population listening to a podcast at least once a month. Bumpers fm is capitalizing on this trend with by providing a discovery engine for podcasts as well as the tools to create your own podcast. With an all-in -ne podcast resource, you wont need any other app to entertain you. AlleyWatch chatted with cofounder Ian Ownbey about the origin of the startup and how it plans to expand. Bumpers is a mobile app that lets people easily discover, subscribe to and create podcasts. Our technology allows users to record and stitch together audio recordings, add segue/background music, add loops, label recordings to keep them organized, automatically erase background noise and equalize your voice so you sound clear and projected. Each week, we create a new prompt to help inspire our podcasters –– it’s fun to see the many different directions a single prompt can go. 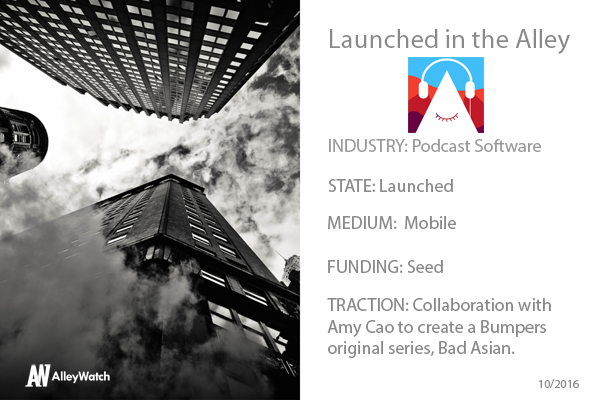 We’re also producing our own original podcast series called Bad Asian hosted by Amy Cao. Bumpers is reimagining the way podcasts are made by replacing the long antiquated audio-editing process with a set of user-friendly tools for instant creation on a mobile app. This is the easiest and best way to make podcast content. You don’t need to have 10 years at NPR anymore to create content that people are interested in listening to. Just focus on the part that’s fun, and share it with people. Unlike most of our competitors that focus on short-form audio conversing or have complicated editing tools, Bumpers is a platform that allows users to create full-length podcasts that are more than just merged audio clips. Bumpers is designed to be used on mobile devices and provides users with an audio-sharing platform that is user-friendly and intuitive, enabling even amateurs to edit their recordings without hassle and without a studio. People really appreciated Bumpers when we were able to show them how we’ve been able to simplify the complicated and overwhelming podcasting tools and softwares that people are currently using. Our target audience is podcasters who want to create compelling, provocative and fun podcasts but lack the tools or professional experience to do so. And unlike other forms of media expression like vlogging or written word, Bumpers allows creators to engage and entertain listeners solely through their vocal personalities –– a form of expression that hasn’t been embraced by mobile media until Bumpers. That’s why there is so much potential and room for growth in this market. Bloggers can have a range of interests from humor to sports to political commentary. We look at Bumpers as being parallel to platforms like iTunes and Pandora. We think there’s enough space in the podcast world for us to share. People search for the same form of content through many outlets because each one provides a different experience. Bumpers gives people a fully functioning media space to create and discover audio blogs that they wouldn’t otherwise be able to through professional studio podcasting sites like Pandora. Measured by Google searches and episode downloads, podcasting has seen 30+% annual growth in recent years. Globally, the audio sector (broadcast radio, recorded music, and on-demand streaming services –– music streaming being most dominant) is worth $65 billion. If podcasting continues to grow as a mainstream medium for content consumption, it can create a shift from broadcast to on-demand audio and put a large part of the $65 billion up for the taking. There are many ways that we can monetize Bumpers. For example, we can earn money through advertisements and we could offer premiums for accessing some of the tracks we have in our music library for segue and background music. Additionally, like blogs, we can open a sponsored content channel for brands. We believe there is even an opportunity for creators to make money by placing ads within their podcasts. If a listener hears an ad while enjoying a creator’s blog, it was ultimately the creator who brought attention to the ad and should receive revenue for it. A friend and I decided to work on a podcast series as a hobby to share with our close friends, but we found the audio editing process to be unnecessarily difficult and grueling to the point where we decided to stop the project all together. This experience showed me how far behind audio development was in the digital age. I wanted to find a solution so that I and other podcasters could enjoy and concentrate on actually creating the content rather than spend time editing it. That’s when I teamed up with Jacob to create Bumpers and bring the lagging podcast development up to date. With content creators practically being an industry in and of itself in LA, why did you choose to launch this venture here? Bumpers introduces podcasting to the dynamic arena of media, setting the stage for people to express themselves using their vocal personalities. Podcasts now have its own unique niche within the mobile media landscape whereas before, the industry was fragmented and left only to those in professional studios. Podcasting has already proven to spark the interest of the general public as professional series, like Serial, went viral. Now, Bumpers provides a centralized space for the industry to grow by making audio blogging more accessible and casual. Right now, our focus is getting Bumpers in the hands of podcasters and to encourage bloggers to try this different form of expression. We’re working on collaborating with more creators to develop original content that is compelling, engaging and delightful for our listeners. So far, Amy Cao has done a wonderful job producing Bad Asian and we look forward to continuing the series with her and delving into more insightful and fresh topics surrounding Asian-Americans. Before I started Bumpers no one told me that as a founder you hear “no” from people constantly. Basically I get said no to as a living. A$AP Rocky. He did a great series with Noisey where he interviewed other rappers and it was basically just them joking around and I loved it. I think he would be really great at Bumpers and people would love it. New York is a very fast-moving city, which fits Bumpers’ on-the-go, easy-to-use software. The city reflects Bumpers’ brand persona as it’s filled with big personalities and has become a hub of news outlets and social media personalities who curate viral and expressive content that’s sought after worldwide. There’s a lot of stories, opinions and characters in this city that can use Bumpers as their voice. My favorite bar is called black and white on 10th and 4th. It is kind of like a rocker bar I guess but is pretty empty all the time. I think it’s run by like vampires or something. I at least get some real True Blood season 2 vibes from there. Me and my cofounder Jacob carved our names into the table in the back like 4 years ago long before we started bumpers.